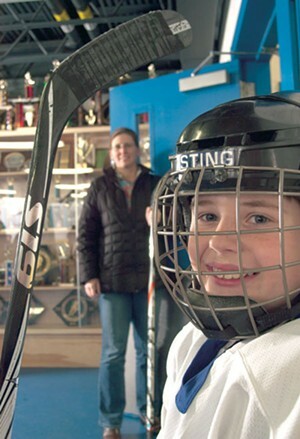 The Puck Stops Here | Features | Kids VT - small people, big ideas! The color-coded whiteboard that combines the hockey schedules of four members of the Burke-Mitchell family rivals the arrivals and departures board in Grand Central Station. It shows that the Jericho clan has 13 activities crammed into the upcoming weekend: 10 games, one practice and two select-team tryouts. Each item is linked to the person in charge of transportation: Mom, Dad or sometimes a teammate's parent. And at the bottom of the board is an important reminder for those busy days, written in caps: "ONE FRENCH FRY ORDER PER KID!" The carefully crafted timetable is the work of Maria Mitchell, who keeps things running smoothly for her children — Patrick, Anna and Molly — as well as for her husband, Pat Burke, who coaches a USA Hockey select team and an Essex Pee Wee team. Burke himself plays hockey three days a week. Hockey is known for the over-the-top commitment and huge quantity of gear it requires, as well as the diehard players and parents the sport attracts. It's not uncommon to see hockey families huddled together in the snack bar between periods, hats pulled down low on their foreheads, hot beverages in their hands, plotting meeting points at park-n-rides, comparing the best pit stops along the way to where they need to go. The logistics of youth hockey are a challenge to manage, but for these dedicated families, controlling the chaos is a way of life. During the short days of winter, travel to and from Vermont's ice rinks mostly happens in the dark, before sunrise or after sunset. But the construction of new rinks and the renovation of some others around the state have made the ungodly 4 a.m. practice time almost obsolete. Practices are typically held twice a week in the evenings, though exactly which evenings — and sometimes even which rink location — may vary to accommodate high school and college team schedules. On weekends from late November through February, though, sleeping in late is simply not an option for hockey families. The Burke-Mitchells rise early for Saturday and Sunday games, some of which start as early as 7 a.m.
"Sometimes we get lucky and all our games are in the same place," says 15-year-old Molly, the Burke-Mitchell's eldest daughter. More often, though, the day involves multiple destinations. Burke, who is the principal of South Burlington High School, says his kids have accepted the fact that their parents can't be two places at once. Last year, because of his coaching schedule, Burke missed a lot of his son's games. Now he's coaching the boys' team, and "I go to 100 percent of his games and most practices. I love coaching hockey, girls or boys, but being with him was at least in part by design." When all three kids were in the Essex youth program, Burke and Mitchell juggled up to 10 games over the course of a weekend. But the hard work of practicing and scheduling paid off: Last season they watched each of their children's teams win a state title. Molly, now a freshman in high school, currently plays for Mount Mansfield and an under-16 select team called the Shamrocks. The team, which picks the best players from around the state, participates in tournaments at the regional level. "I've always loved hockey and enjoyed the atmosphere at the rink," Molly says. "It's just something I look forward to every day." The same goes for catching each other's games. "I love going to see my brother and sister play and cheer for them," Molly says. "It's good to have fans." Chuck Wiegand started playing hockey as a kid in 1974, then went on to win state titles with Mount Mansfield and Essex high schools. After graduating in 1987, he was drafted by the New York Rangers, but never played for them. He kicked around the semi-professional leagues until returning to the state in the late '90s. When it came time to sign up his two children for hockey, Wiegand's wife, Chris, says there really was no discussion. Both Charles, 9, and Celia, 6, had started skating as two-year-olds, and their dad introduced them to hockey at home long before they stepped onto the rink. "In Vermont, you really need to find a winter sport to embrace, and this just happens to be ours," Chris says. The family watches hockey games together on TV, and the kids have taken to shooting at a homemade goal in the basement — it's a chance to try out dad's slapshot on solid ground. "Our weekends are totally consumed with hockey as our kids are going in two different directions now," Chris says. "But we wouldn't trade it for anything. "They are learning so much about being a team player, making good friends and building self -confidence. We both feel that it is essential to get kids interested in healthy behaviors, and we will foster that as long as we can. If they're having fun doing it," she says, then she and her husband are on board. The kids are also learning responsibility. Participating in the sport requires keeping track of all the gear (see sidebar: "What's in the Bag?"). As they undress at the rink, removing jerseys, and the padding that protects their heads, shoulders, elbows, hips and legs, Chris says they've learned to return everything to the bag. All that protective gear is costly and needs to be replaced about every two years as the children grow, so misplacing an item is a serious offense. Wiegand has coached his 9-year-old son, currently a Squirt in the Essex program, every year and joins his daughter on the ice at the intro level whenever their schedules allow. He's watched his son progress from needing assistance with everything to suiting up for the ice on his own. Until kids are strong enough to do it themselves, they need help from an adult to tie their skates, yanking the laces as tight as possible to keep them safe and stable on the ice. As for coaching, Wiegand's philosophy is simple. "I try to keep them happy and motivated so they come back the next day," he says. He emphasizes the importance of "learning your edges," skating tight arcs along the inside and outside edges of the skate blade to improve agility, and he supports the switch to cross-ice games — played on rinks divided by foam panels — for 7-and 8-year olds (see sidebar). Both practices, Wiegand says, develop better skaters and result in less frustration down the road. Youth hockey sometimes gets a bad rap. A certain amount of violence is tolerated at the game's professional level, and that intensity has, on occasion, infiltrated the younger ranks, not to mention their parents. Search "hockey parents" on YouTube and you'll find plenty of videos of pushy parents losing their cool — but thankfully no footage of the notorious fight in 2000 between two fathers in Reading, Mass., that left one dead and the other convicted of involuntary manslaughter. Luckily, in Vermont, says Burke, the lack of tryouts at the youth level keeps the pool of players deep — just over 4000 kids registered last season — and cuts down on some of the tension that can develop on both sides of the glass. For the most part, parent representatives help youth hockey programs run smoothly. For example, every team has a volunteer commonly and lovingly referred to as the Team Mom. She keeps everyone informed about the schedule and issues passed along by USA Hockey and the Vermont State Amateur Hockey Association. She's also the go-to mediator when conflicts flare up between parents and coaches. Kim Magoon is Team Mom for her 10-year-old son's team in Barre. "I didn't really know what I was getting myself into," she says, laughing. "But it's not such a bad thing. I got to meet and talk to families." Should a game ever be canceled due to weather, it's Magoon's job to get the word out. But weather cancellations are rare. Trips through ice and snow are a big part of hockey family lore. Once, Burke recalls, while driving Molly to a state tournament game in Barre, his wife slid off the road twice and tried to talk the service guy into driving her to the rink. Ultimately, she made it there, on her own, arriving late in the third period. The Burke-Mitchells always make an effort to get to games, but draw the line at taking serious risks. If the miles they've put on their two vehicles — 200,000 on their Subaru and 112,000 on their Toyota van — are any indication, they've covered a lot of ground getting their kids to the ice. All that driving has its advantages. "The thing about ice hockey is the time that we spend together as a family," Burke says. "We would miss a lot if they didn't do it." —Got a comment? Contact Kate@kidsvt.com or Cathy@kidsvt.com. Kristin Fletcher is a former sports editor for the St. Albans Messenger and Barre-Montpelier Times Argus who lives in Cabot. She has two children, 12 and 9, and works for Re-Bop Records. When it comes to teaching kids hockey, there are two schools of thought: Let the strongest skaters dominate on a full rink, or shrink the playing surface to give even the wobbliest skater a chance to touch the puck. The latter, known as cross-ice, sets the games across the width of the ice. Vermont has moved almost entirely to cross-ice play at the Mite level, with the exception of a few end-of-the-season tournaments. 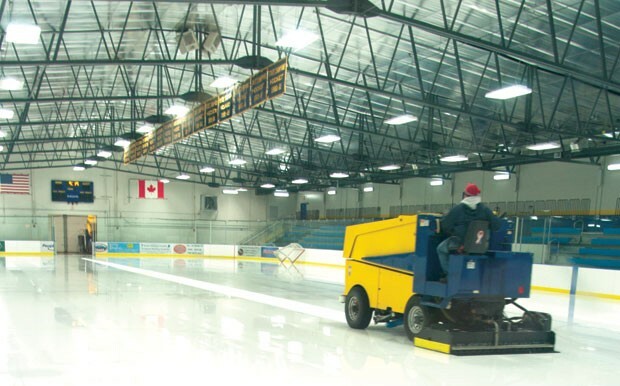 A standard rink is 200 feet long and 85 feet wide. Cross-ice games use portable foam panels to divide it into smaller rinks. Teams typically play three rather than five players to a side, focusing on passing and stick handling rather than speedy skating. Vermont's embrace of the practice puts the state way ahead of the curve, according to Roger Grillo, regional manager of USA Hockey's American Development Model. "It's really common sense," says Grillo who assisted the Norwich and UVM men's hockey programs and was the head coach at Brown for 12 seasons. "In every other sport we do for the kids the playing field is downsized to the size of their bodies." Grillo likes to point out that if an adult were playing on a proportionately similar rink — assuming a 5-, 6-, or 7-year-old is roughly half the size of that adult — they would play on a 400-foot-long hockey rink. That's a lot of ice. Still, cross-ice has been a tough sell in most communities, with tradition taking precedence over developmental concerns. Minnesota is the only other state to embrace the change, Grillo says, while in Europe it's common practice to play cross-ice games until age 11. "It's conducive to the kids gaining confidence, getting touches and playing as opposed to chasing," he says. 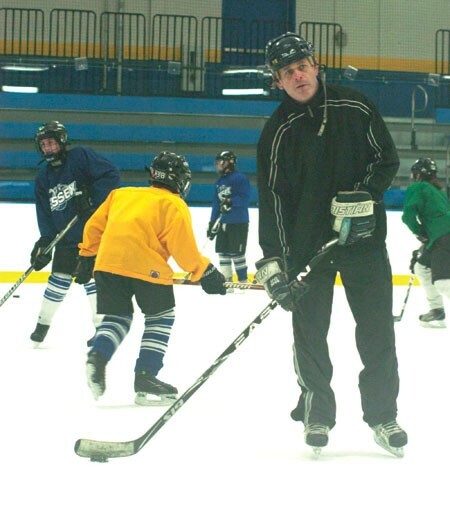 Essex youth coach Chuck Wiegand is all for cross-ice, too. "Times change," he says. "You don't want to travel an hour and a half away to see your kid on full ice not touching the puck. 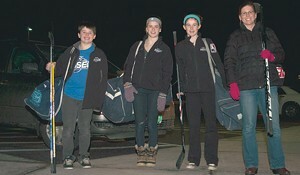 "Youth hockey players build strength simply by carrying their gear to and from the rink. By the time they're Mites, they're expected to do all the heavy lifting themselves. Luckily, most hockey bags come equipped with wheels. Goalie bags are even bigger and contain additional protection for the neck, chest, arms and legs. That includes a blocker glove for their stick hand and a catch glove for the other. Equipping one hockey player with all new gear can easily cost $200. But most sporting-goods stores also carry pads, pants and skates in good, used condition for about a third of the price, says Ashley Thygesen of Barre's Thygesen Sports. Wooden sticks ($19.99), or composite ones ($57 and up), and hockey gloves ($23.99) are less secondhand-friendly, simply because they withstand so much wear. Hockey helmets ($49.99) should always be purchased new and before the expiration date stamped on the back. With all of that crammed into their bags ($39 and up), players carry their game jerseys on hangers, neatly protected in a garment bag (with personalized team logo, $23), far, far away from the hockey bag's stinky interior.